OVER four times as many post primary pupils in the Republic of Ireland avail of cross border education in comparison to their counterparts in Northern Ireland, an investigation by Meon Eile and The Detail can reveal. 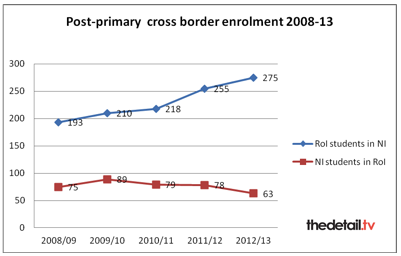 During the 2012/13 academic year 275 students with addresses in the Republic of Ireland (RoI) enrolled in post primary schools in Northern Ireland (NI) in comparison to just 63 students with addresses in NI who enrolled in post primary education across the border. Queen’s University Professor of Education, Tony Gallagher, has raised concerns that cross border education could get caught up in a political row. He said: “Too many issues in education become fractious and there is a risk this might happen here as well. In the past the assumption was that the numbers crossing the border probably balanced each other out, and were likely to be small in any case, so there was no real need to look into detail at what was going on. Speaking to The Detail, Sinn Fein’s Catriona Ruane MLA and former Minister of Education in the Northern Ireland Assembly, said issues of “cross border mobility” for students in NI to avail of the educations services in RoI need to be addressed. Meanwhile, chair of the assembly’s Education Committee, DUP MLA Mervyn Storey acknowledged that while cross border education was a practical choice for some parents in border regions, he believes there needs to be a payment regime to reflect current trends. The figures obtained by The Detail under the Freedom of Information (FoI) Act show that since 2008, there has been a 42% increase in the number of post primary pupils from RoI enrolled in Northern Ireland’s schools. During the same period there was a 16% decrease in pupils from Northern Ireland enrolling in post primary schools in the Republic. The breakdown provided by the Department of Education in Northern Ireland (DENI) show that Holy Cross College, Strabane has consistently been the most popular school for pupils resident in Republic of Ireland over the past four years. 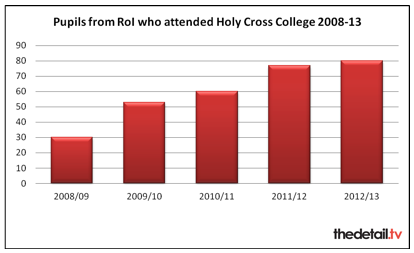 In 2012/13, 80 pupils from the Republic enrolled in Holy Cross College; more than the total amount from Northern Ireland that enrolled in post primary education in the Republic during the same period. Holy Cross College opened in September 2004 with the amalgamation of Saint Colman’s High School, Our Lady of Mercy High School and the Convent Grammar School. Professor Tony Gallagher of Queen’s University Belfast says the trends in cross border education can be explained by local factors. The Royal School, Armagh, a partial boarding school is the second highest for cross border enrolment with 41 pupils from RoI. 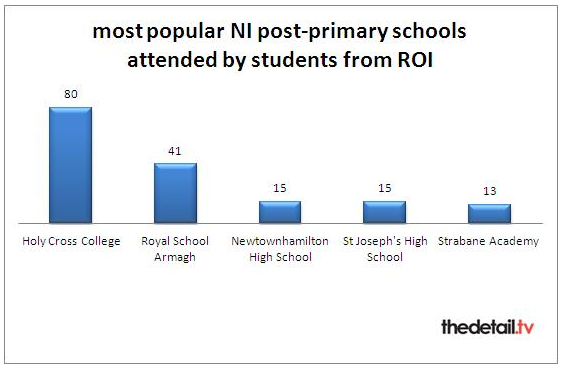 Newtownhamilton High School and Saint Joseph’s High School, Crossmaglen, County Armagh are the third most popular schools with pupils from Republic of Ireland. Garnet Mullan, principal of Newtownhamilton High School, believes the local church community has a vital role in supporting cross border education within the school. He said: “Clergy from local churches take an assembly in school every week. In some cases, a minister would be in charge of three congregations; one may be in Northern Ireland and the other two in Southern Ireland. For that community, the border is largely irrelevant. Our school serves a community of people that straddle the border. The previous Minister of Education, Catríona Ruane MLA brought a paper to the Northern Ireland Executive in 2010 indicating that she wished to introduce legislative changes. Speaking to the Detail she said that current legislation restrains cross border education. She said: “I think we need to start looking at what are the obstacles to cross border mobility and to knock down those obstacles. One is in the North of Ireland, they start younger and they leave primary school younger. I’d like to see that synchronized. “This affects people from all communities. There are people in Cavan and Monaghan and if they choose to send their children to a state school, the nearest one could be the other side of the border. We have to be sure that we don’t discriminate against anyone whether they are Catholic, Protestant or no religion. “I do believe that there are certain cases where people can take a case under EU law because it’s discriminatory that you have to be resident in the north of Ireland and that you gain entrance before somebody in other parts of Ireland. Mervyn Storey, chair of the Education Committee acknowledged cross border education is a practical choice for parents in border regions; however he is seeking a payment regime to reflect current trends. He said: “The legal position is that the Northern Ireland education system has a priority to ensure that pupils from Northern Ireland are given preference and that should remain the case. The practice to date, has been where there are surplus places, those have been made available to pupils from outside Northern Ireland. “We have well in excess of 270 pupils who are coming from the Republic which over the past number of years has increased by something over 40%. That does have a cost implication to the Northern Ireland Exchequer in that there are pupils that are being educated at the cost of the Northern Ireland Exchequer and that is not being picked up by the Republic of Ireland. In response to a Freedom of Information request from February this year asking for a breakdown of the schools attended by children from the Republic DENI said: “There is a long standing practice of reciprocity between the Department of Education in the North and the Department of Education and Skills in the South in respect of the movement of pupils within border areas. In its response the Department also said it was unable to provide us with a financial figure for the cost of cross border education here. In December 2011, Minister of Education in RoI Ruairí Quinn and the Education Minister in NI, John O’Dowd, agreed to a joint survey of the pupils in the border area. The survey aimed to establish the current and future schooling need in border regions. The results of the survey are due to be presented at a meeting of the North South Ministerial Committee Friday November 8 2013.